Truly the BEST BCAA's!!! I am addicted to the Orange Paradise! It's best when served with super cold water or over ICE! This product is a MUST during my workouts and I also enjoy throughout my day when I carve something sweet. It's amazing the difference it makes in my endurance and recovery time plus I LOVE the taste. If you need a boost to your day and / or working on shredding some lbs ...this is it!!!!! I love BCAAs for what they do! Green Apple is pretty good as some of the others can be a bit sweet. It's a little more tart with just a hint of sweetness. My other go to is Raspberry Lemonade - a little more sweet but pretty dang good. I'm obsessed with these bcaas!! I haven't tried all the flavors yet but so far out of the few I have they're amazing and there's no weird aftertaste. It's awesome there's coconut powder and it really helps with keeping hydrated while boosting recovery and the fat loss blend is a great addition in the bcaas. Even helps with sweet cravings. I am new to BCAAs and loved the results from them. I hope this review says 5 stars because i can't see exactly how I am rating it. I have loved the taste of raspberry lemonade, i did try the strawberry kiwi and was not a fan but i think if you are interested you should try a sample pack and see what works for you. I highly recommend this product and taste/variety of flavors. It has helped with muscle soreness as I am lifting heavy 6 days a week and am able to maintain the workout program and not be too sore. I really like the BCAAs. At first I thought it was way too sweet, but then I added more water and ice and now it's perfect. I like drinking it throughout my workouts and sometimes in the afternoon instead of plain water. It also helps me recover more quickly after a tough workout so I can stay on my workout plan. I'll definitely order more when this runs out! I started running with a coach in September. I am using the BCAAs to help me during the runs, it has made the difference in my endurance and how fast I recover. I simply LOVE THEM!!! I have tried: Raspberry Lemonade, Green Apple, Pomegranate, and Grape. All of them are superior! I got to ran the Miami Half Marathon with the BCAAs with me! Thank you!!!!!! 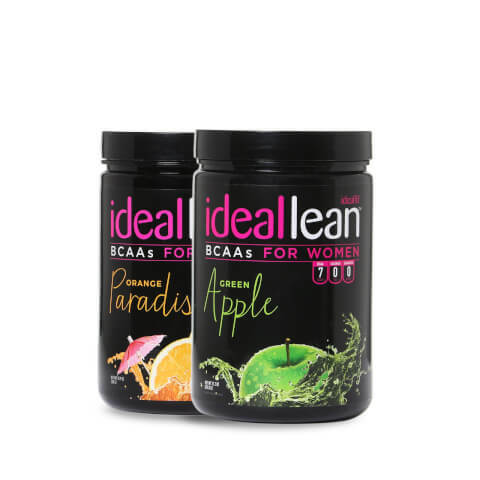 I actually really love the Idealean BCAAS- I definitely noticed a difference when taking them twice a day. My workouts don't leave me sore anymore- it's great! I actually only use a half scoop per serving, and that's all I need. The sweetness is just right and I still get all the benefits. My favorite has been pink lemonade, but I do like the pomegranate too. Definitely recommended!! I LOVE Bcaas. The green apple is my favorite flavor. Helps so much with my muscle recovery. I use it everyday. I went a week between orders I could physically feel a difference. Highly recommended! Love the Grape Explosion the best. And the Green apple. I haven't tried all of them though. The best thing about the BCAA's is that I don't get too sick when I drink them throughout the months I had them. I have a weak immune system for the most part but the BCAA's really helped anytime I felt groggy or weak. I've been using Ideallean BCAAs for about 10 months. I will never go back to plain water during a workout. They taste awesome and I instantly notice a difference in recovery. My muscles aren't as sore after a work out and I can go into my next workout a day later without pain from my previous workout. 10/10 would recommend to anyone that works out 4-5 times a week!